Do you know how to convert AIFF to MP3? 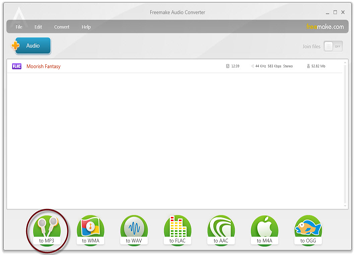 It's the easiest task if you use free Freemake AIFF to MP3 Converter. 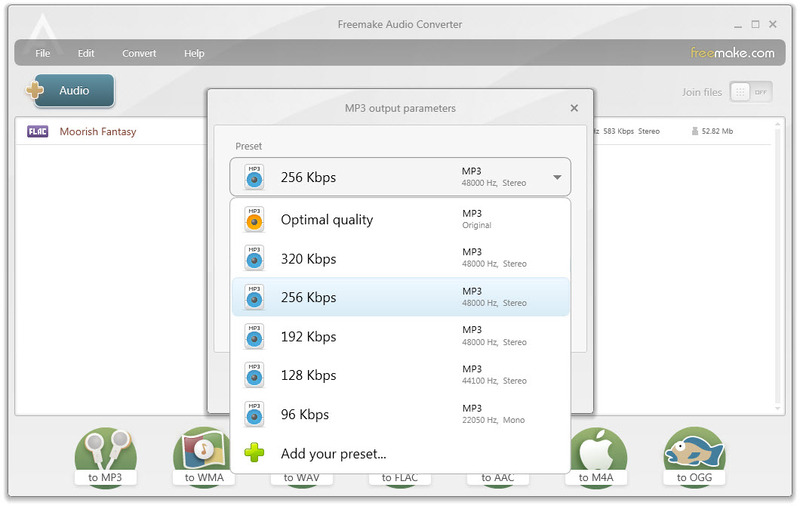 Convert AIFF to MP3 in just 3 clicks without quality loss. Keep the original sound of AIFF songs in a small MP3 file. All AIFF files are supported. Best AIFF to MP3 Converter with no limits! Don't waste your time on unstable online services or difficult programs. Click here to try the fastest solution right now. Go to the official Freemake website and select the necessary software. 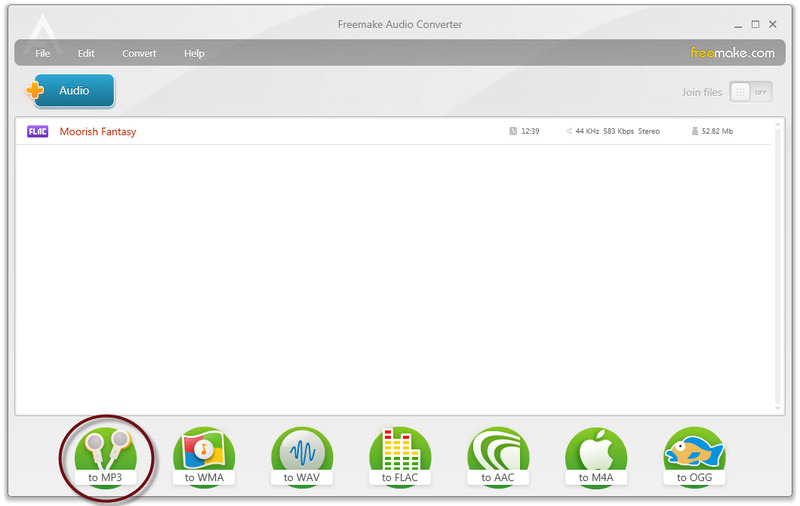 Click to download Freemake AIFF to MP3 Converter. If your connection is slow, it's recommended to select a full installation file. It can be installed on your Windows PC without the Internet connection. When the installation file appears on your PC, double-click to run it and install the free AIFF to MP3 utility. Please note that Freemake AIFF to MP3 Converter runs on Windows 10, 8, 7, and Win Vista. Mac or Linux operating systems are not supported. As soon as the installation process is completed, the AIFF to MP3 freeware will start automatically. Click the "+Audio" button to add your AIFF music files that you want to turn into MP3 audio. Alternatively, you can drag-n-drop the songs from a folder, export from a flash drive or a music disk. You can convert even large AIFF to MP3 and add as many AIFF tracks as you need to batch convert AIFF to MP3. The only thing to keep in mind is that your AIFF music songs should not be protected or corrupted. AIFF format sound to MP3 converter doesn't support protected media. On the formats panel, click "to MP3" green bubble to convert AIFF to MP3. In a new window, choose the desired quality for your tracks. To keep the original quality, select the a 320kbps option. If you want to significally reduce the size of your future file, select a 192 kbps option. In this case, you will get an average sound quality and a small file size. If none of the ready quality choise fullfils your needs, you can create a custom profile with the desired settings. To do it, click the drop-down menu with ready-to-use qualities and scroll to the bottom. Click on the “Add custom preset” option. Set the necessary data manually: codec, sample rate, bitrate, etc. In case, you want to use the preset in the future to transcode audio from AIFF to MP3, select an icon for it and add a title. When you are done with the settings, click the "Convert" button to convert AIFF to MP3 free. The conversion speed highly depends on your PC capacity and the amount of files. Please note that the software won't change the original files but will create new MP3 ones in a specified folder. So make sure you have enough of space on your hard drive. When your audio files are ready, you may use any media player to listen to them or transfer the MP3 tracks to your portable device. AIFF or Audio Interchange File Format is an audio file format developed by Apple Inc. in 1988. AIFF format is most commonly used on Apple desktop computers and laptops. AIFF audio can store such metadata as track title, artist, comments, and copyright notes. There are two types of AIFF files: compressed ones (AIFF-C) and uncompressed. Usually, AIFF audio is uncompressed. It means that the files have a very high sound quality but occupies too much space on a hard drive. AIFF vs MP3: Is AIFF the same as MP3? No. AIFF audio files differ from the MP3 ones. AIFF is an uncompressed format. It gives better quality, but AIFF files are heavier than MP3 ones and thus occupy too much space. Besides, MP3 is supported by almost all sound players while for AIFF files you might need to download additional programs and apps. Can iTunes convert AIFF to MP3? Yes, you can use iTunes to convert media files between formats. To convert AIFF tracks to MP3 with iTunes, first of all, download iTunes on your PC or Mac. Then install the software and add your AIFF files to iTunes. Click the General tab -> Import Settings -> Import Using. Select the MP3 option if you want to make MP3 out of your AIFF files. Click OK to save the settings. After that, select AIFF songs that you want to convert to MP3. Click File -> Convert -> Create MP3 Version. iTunes will automatically create new files in MP3.